Hallie Bennett loves flirting with danger. So when a man with trouble written all over him walks into her shoe shop, she finds him impossible to refuse. Nick needs a "wife" for a week to seal a Hong Kong business deal, Hallie needs £5,000. It might not be the most traditional Valentines Day proposal, but shes hardly a traditional girl... Two beautiful (and borrowed) Tiffany rings later, and Hallies on her way to live the high life. But the trip comes with a deadly twist. With the most romantic day of the year fast approaching the shelves are beginning to fill up with the all of the hot romance books to get you in the mood for love! 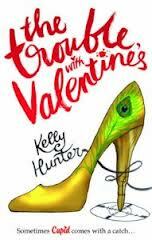 My second Valentine’s book I have read so far this year is The Trouble with Valentine’s by Kelly Hunter which is my second book by this author. I read her book Single Girl Abroad whilst on holiday last year and remembered thoroughly enjoying it especially the mouth-wateringly handsome men she created in the book! The cover of the book is not one that would appeal to me when browsing for a book but it is where the age old saying comes to light “Don’t judge a book by its cover”. Our leading lady in this book is Hallie. Hallie is a very down to earth character who works in a shoe shop but who is about to embark on a very surreal adventure, when the heart-stoppingly gorgeous Nick comes shopping for something you do not usually find in a shoe shop……. He needs a temporary wife for a week! Yet again Hunter manages to create another drop dead gorgeous lead male character and we also see the use of martial arts make another appearance in this book so it is something that the author must have researched well and have some enjoyment in to have this appear in both books. As I am sure you have worked this isn't going to be a story line anyone can relate to (unless I live a very sheltered life!) but never the less it was an enjoyable read. It is a very light and breezy novel which I finished in no time at all. There were quite a few steamy scenes in this book which did begin to feel as though it was taking over the story line a little but this is fiction! I enjoyed the supporting characters Jasmine and Kai just as much as our main characters if not a little more as there background story intrigued me. I felt the ending was left open so I am sure there must be a sequel to this book on the horizon I hope in the next book we get to read more about Jasmine and Kai ! If you are looking for a romantic easy read this Valentine’s Day then this is the one for you. Sounds like a fun read for February. Thank you so much for this fantastic book giveaway, that i would love to have the chance of reading!! Perfect for Febuary coming up...it sounds like a brilliant read. I love your selection of book titles. Most of them are on my TBR list! fab give away just in time for valentines day.. Sounds Great, would love to win! I have just finished reading this book and could not put it down. One word, amazing!! !